pls buy manila bulletin today (sep 30) for your free copy of style weekend for men (every last friday of the month)! 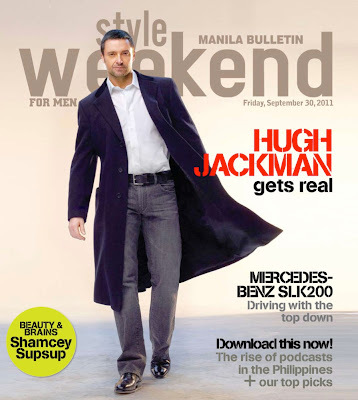 on the cover: hugh jackman gets real in "real steel"! also in this issue: driving a red mercedes-benz SLK200 with the top down, the rise of podcasts in the philippines + our top picks, get ready for stomp, jeans F/W collections, shamcey supsup centerfold, and more!